The amount of stock going into knackeries is double what is normal for this time of year according the Irish Cattle & Sheep Farmers’ Association. ICSA president Patrick Kent said the ICSA has had feedback from licensed knackeries which indicates that the impact of the fodder crisis and the ongoing bad weather since last July is really taking a toll. Knackeries, he said “are flat out collecting dead animals which shows just how bad things are. If the Minister is in any doubt he should talk to the people who are at the coalface of dealing with this crisis. “The ICSA president added that it is now time to stop the relentless focus at all costs on increased production and ever higher stocking rates. “This fodder crisis is the second major fodder crisis in five years. With the high stocking rates that have been advocated, everything must go right or there are consequences. We are witnessing those consequences now and with two crises in the last five years, the trend is bound to continue. “Systems have been pushed beyond their limits and there is no safety cushion built in for when things go wrong. The wet autumn, the early onset of winter, the snow and late spring have all combined to throw everything out of whack. If it had have been a good year weather-wise we might not be in the situation we’re in, but it hasn’t been a good year and farmers can’t cope. Mr Kent also criticised the Department of Agriculture for failing to react to the crisis sooner. 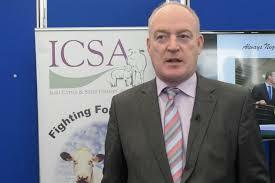 “ICSA has been flagging a fodder catastrophe for months now. It’s not good enough to expect farmers to maximise production to meet overly ambitious export targets and then wash your hands when trouble hits. It’s all been about high input and high output and takes no account of labour or the added stress and pressure it puts farmers under. “Advice to get into so many cattle is all well and good, but at the end of the day it’s still a gamble when you can’t control the weather. “The next few weeks are bound to be the most difficult of all with little improvement in weather conditions forecast.